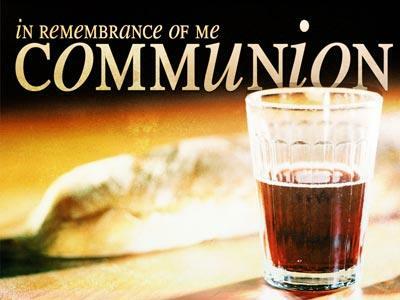 Summary: A message about the importance of taking Communion togeather. 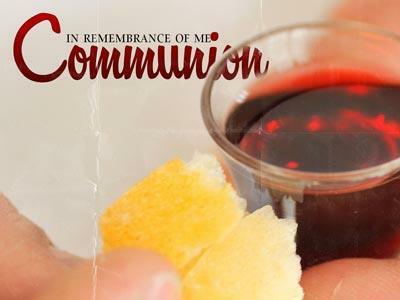 Communion Sunday Again – What’s it really all about? - The Corinthians abused it. - The Romans misunderstood it. Persecuting Christians as cannibals. - Roman Catholics misused it. A Requirement for salvation. The fact is that if you don’t really understand this whole communion thing you are not alone. This week I want to look at reasons why we practice this tradition. My hope is that it will add a demention of understanding and joy to your experience. 23For I received from the Lord what I also passed on to you: The Lord Jesus, on the night he was betrayed, took bread, 24and when he had given thanks, he broke it and said, "This is my body, which is for you; do this in remembrance of me." 25In the same way, after supper he took the cup, saying, "This cup is the new covenant in my blood; do this, whenever you drink it, in remembrance of me." 26For whenever you eat this bread and drink this cup, you proclaim the Lord’s death until he comes. 27Therefore, whoever eats the bread or drinks the cup of the Lord in an unworthy manner, will be guilty of sinning against the body and blood of the Lord. 1. Communion is about submission. 2. 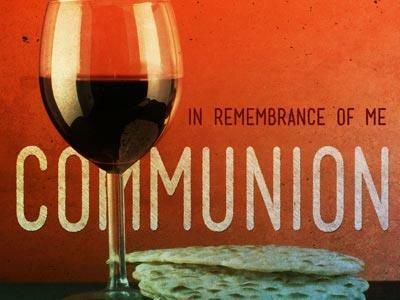 Communion is about commemoration. A. Until now the observation of the "Passover Supper", was done in remembrance of what God did to deliver Israel from the captivity of Egypt. B. The feast was now to be a feast of covenant and remembrance. The covenant was that of fellowship. Jesus was saying that their receiving of these portions were symbolic of their participation in His death. Furthermore, they were now to remember His death as deliverance from eternal captivity to eternal life. C. Jesus picked up the cup, filled with wine, set aside for the anticipated messiah. He was proclaiming to them that He was the fulfillment of everything they had been waiting for. About 1930, a Communist leader named Bukharin journeyed from Moscow to Kiev. His mission was to address a huge assembly. His subject, atheism. For a solid hour he aimed his heavy verbal artillery at Christianity, hurling argument and ridicule. At last he was finished and viewed what seemed to be the smoldering ashes of men’s faith. "Are there any questions?" Bukharin demanded. A solitary man arose and asked permission to speak. He mounted the platform and moved close to the Communist. For a while he slowly scanned the audience. At last he shouted the ancient Orthodox greeting, "CHRIST IS RISEN!" The vast assembly arose as one man and the response came crashing like the sound of an avalanche, "HE IS RISEN INDEED!" 3. Communion is about proclamation. When we partake in communion we are declaring ourselves to be covenant children of God. 6But the ministry Jesus has received is as superior to theirs as the covenant of which he is mediator is superior to the old one, and it is founded on better promises. 38The curtain of the temple was torn in two from top to bottom. 39And when the centurion, who stood there in front of Jesus, heard his cry and saw how he died, he said, "Surely this man was the Son of God!" 4. Communion is about anticipation. A message about the importance of taking Communion togeather.